Very much like Shazam, Soundhound app lets you tag and identify music around you so you won’t have to ask yourself “what song is this?” or “who sang this song?”. The app is free and is Mango ready. 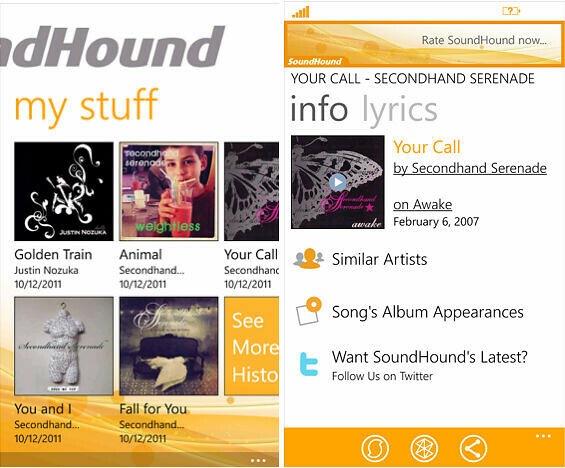 To use the app to identify music, just simply tap the big Soundhound button, let it sample the music and it’ll ID it for you. From there, you can “buy” the song (which bring you to the Zune Marketplace), share the find on Twitter and/or Facebook or to sing along to the lyrics. – Fast music recognition: name tunes playing from a speaker in as little as four seconds. Unlimited usage! Previous tags are saved in the “my stuff” section. 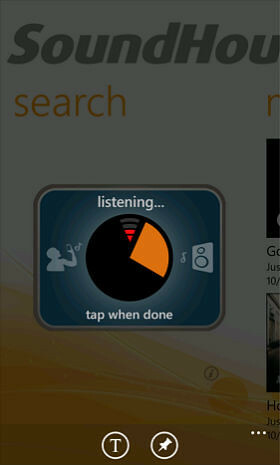 Being a Windows Phone app which is Mango ready, the app can be pinned to the Live Tile so you can instantly tag song by tapping on the Soundhound tile. This is very useful when you want to identify a song in a tv commercial which usually ends in less than a minute.